Mandatory maintenance is an apt oxymoron that sometimes defines real estate today. The combined efforts of landlords or property managers in ensuring properties under their portfolio are well-maintained leaves much to be questioned. Usually, maintenance is more of an auxiliary function of property management firms, as the focus is on acquiring new customers or retaining existing ones. But here’s something to jolt you. A study by the RRD found property managers end up spending 23% of their time handling multiple maintenance requests. This could be because they haven’t tried using a real estate software company which can streamline their activities. The amount of time maintenance requests eat into a property manager’s bandwidth is downright-ly criminal. This shouldn’t bring one to the conclusion that focusing time on maintenance is non-beneficial, but there is real estate project management software packages that can improve this increasingly critical function of property management. Finding the optimum online real estate software company begins with knowing its multiple benefits. If the software is eating the world, then data is the nutrition that supplies its energy. Today’s generation of real estate software companies goes beyond just automating tasks with input and output commands. They are able to invest in large amounts of data, like results from ongoing repair or service checks at the firm’s owned properties, and manage this data across the operational period of a business. By not using the services of an online real estate software company, property management firms are missing being part of the cohort firms that are slowly, but steadily moving the perception of maintenance management towards a more positive and favourable function. Property managers now understand the strategic importance of maintenance, and with the help of the best software for property management, they will be able to better handle a complex range of maintenance requests across all their assets. The property market is typically riddled with gaps that participants sometimes take advantages of. It leads to significant wastage of resources and loss of trust across stakeholders. Choosing a reliable online real estate software company is key to plugging these gaps as there are adequate checks and balances that can be installed. The company with the best software for property management will ensure that day-to-day operations of the property management firm are monitored, rules for automatic flagging or non-compliance are set, and exigencies are accounted for well in advance. The latter could be critical activities or incidents that result from asset mishap or human error, something that could have been avoided with diligent maintenance. Using a good online real estate software company with preventive maintenance modules help managers jump over fundamental safety or track hurdles. Machines and technology are meant to overcome the limitations humans impose on a business. These could be intrinsic (behavioural characteristics) or extrinsic (physical or mental capabilities). After all the best practices that the world’s biggest market has got accustomed to, sometimes becoming its own Frankenstein, real estate software companies are adding new age technologies like artificial intelligence to their solutions. The combination of abundant data sources, big data and analytic systems that make sense of the data, and intelligence to draw patterns can provide significant benefits that outweigh the results seen in other sectors. An online real estate software company can now go beyond de-facto maintenance tools and provide predictive maintenance technologies that can forecast wear and tear of residential plumbing, in advance. It can alert the tenant, owner and pre-approved vendor so action can be taken much before the system fails critically. Real estate project management software is certainly becoming nimble and disruptive, a characteristic of the technology itself. Technology has helped the real estate sector evolve faster in the past ten years than in the ten years that preceded it. New, bespoke online real estate software companies are now offering cutting-edge and tailored solutions for niche market challenges, and are driving the market to offer agile and targeted solutions. Two key features that are typical with almost any real estate project management software are portability and automation. Most of the solutions offered are directly hosted on the cloud, allowing users to access maintenance reports from their desktop, mobile or tablet, update fields in real-time, and create backups so relevant personnel are updated, and closures are ensured. Routine tasks like filling data sheets or generating service reports for legal purposes can all be rendered to an automated system that can deliver the same output i.e at twice or thrice the speed of a typical human team. Such benefits of the best software for property management give back valuable time back to property managers to focus on higher-value tasks. 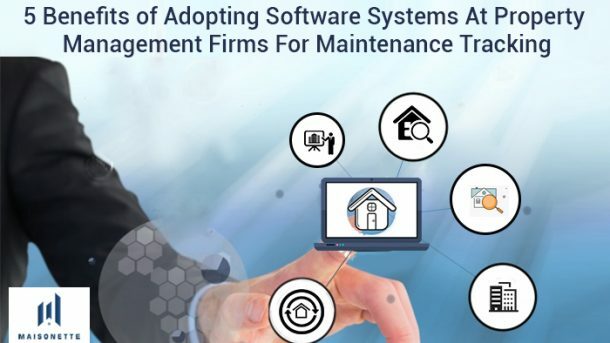 Amidst all the functions of an online real estate software company, maintenance management must be the founding pillars to ensure a long and sustainable business. Sales and retention happen at periods along the tenant journey, but keeping the property functional and refreshing for tenants is an objective that must be frequently addressed. An online real estate software company would cripple itself without using relevant solutions offered by real estate software companies, as the sheer number of work orders or service orders would be impossible to manage manually. Leveraging the benefits offered by maintenance software will help you not just fast track your existing efforts, but accelerating at a pace your competitors will most likely not be able to match.